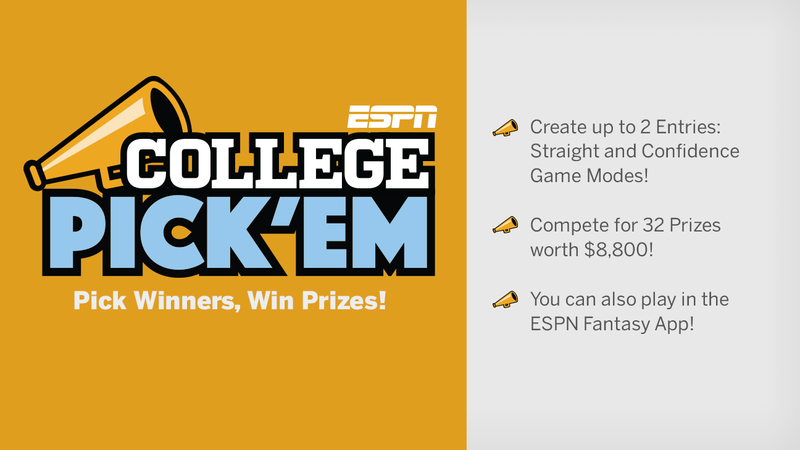 Welcome To ESPN College Pick'em! The college gridiron has returned! With the new season comes everything we love: loaded Saturday schedules, big name schools, Heisman contenders and the College Football Playoff. Who will be this season's disappointment? Can a surprise team make the leap? Now is the time to put your knowledge to the test! Each week we'll pick 10 matchups from the full slate of games to choose from, some more evenly matched than others. It's up to you to pick the winners. Looking for more fantasy games? Play ESPN Fantasy Football for free! There are no surprises at the top of the 2018 pre-season favorites list: Alabama, Clemson, Ohio State, Georgia and Oklahoma are all in contention, among others. When you see one of these programs as an option they are worthy of serious consideration. Straight-Up: Pick the teams from the 10 listed matchups that you feel are most likely to win. Correct picks earn you points towards your season total. Confidence: Here you're not only picking the winners of each matchup, you're RANKING each selection you make based on how confident you are. Your most confident pick will be assigned 10 Points while the least will be assigned 1, placing an added emphasis on correctly selecting your top picks. You can create an entry in BOTH the straight-up and confidence versions of College Pick'em, each offering a $2000 Amazon Gift Card to the contestant who scores the most points throughout the season. We're also offering a $100 weekly prize for the top competitor in each format so you're never out of the running for a payday. To help you along the way be sure to check out ESPN Chalk for all your research needs. Good luck and have fun!